THE BAND:HIGH ON THE HOG: 1996: 2 STARS OUT OF 5 STARS: They are really missing Robbie Robertson’s songwriting on this one-ten songs, nine covers. I thought the first comeback album they were able to get by -they chose better songs to cover? Nothing stands out to me on this album like say Atlantic City, Remedy and Blind Willie McTell did on Jericho. THE ZOMBIES: ODESSEY AND ORACLE: 1968: 5 STARS OUT OF 5 STARS: I am trying to work in at least a few 1968 albums in each week. This may have been the most overlooked great album from that year. Time Of The Season was the big hit on this album but it only stands out from the rest because I have heard it over the years so often. THE BYRD’S: THE NOTORIOUS BYRD BROTHERS: 1968: 5 STARS OUT OF 5 STARS: This is the first of two Byrd’s albums in 1968- the second one was Sweetheart Of The Rodeo with the addition of new member Gram Parsons. This album has gained in reputation over the years as The Byrd’s most experimental album, mixing in electronic music. At the time of recording it David Crosby was fired and drummer Michael Clarke left. Listening to this album and Sweethearts Of The Rodeo just months later it is at times hard to believe it is the same group. This album experiments with the psychedelic sounds of the times and also mixes in the folk rock they were noted for, and some jazz and county music. Favorite songs-Goin’ Back [a cover of the King-Goffin song} Wasn’t Born To Follow- which ended up on the Easy Rider soundtrack, Change Is Now and Old John Robertson. There were no hit singles on this album and the album peaked at #47 on the chart. Kind of got lost in the shuffle at the time of release. 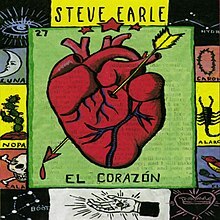 STEVE EARLE: EL CORAZON: 1997: The third album in three years from Steve Earle- back when he was recovering from addiction and seemingly working 24/7 to keep busy. One of my favorite Steve albums- from the mid 90’s to early 2000’s he could do no wrong. Favorites here- Christmas In Washington, Taneytown, Telephone Road, N.Y.C., Here I Am and Fort Worth Blues. THE BAND: JUBILATION: 1998: 3 1/2 STARS OUT OF 5 STARS: An improvement over High On The Hog. This would be the final album from The Band- again no Robbie. More originals than covers which may be one reason this album sounds more like a Band album which is the key-High On The Hog to me didn’t sound much like The Band.